Sowerby Bridge kept the Halifax League Division One title race bubbling and boosted their own promotion hopes with victory in a bizarre game away to leaders Illingworth SM yesterday. Nerves seemed to get hold of batsmen from both sides at The Ainleys with 19 wickets falling for just 113 runs, the second-placed visitors clinched a one wicket win by the skin of their teeth. Asked to bat first on a pitch which had been well protected from the Friday night rain, Illingworth got off to the worst possible start, losing two wickets in the first over. Jake Dixon seemed to have a mesmerising hold as he removed Calum Cook and Daniel Murfet in quick succession and when Sam Mellor added two more in his second over Illingworth were in dire trouble at 7-4. Worst was to follow for the home side as that score rapidly became 15-7 in just the 10th over, scarcely credible to a decent crowd. A brief rally between Jamie Moorhouse and skipper Ben Robertshaw doubled the score but when Robertshaw was adjudged lbw there seemed no way back at 31-8. Moorhouse and Adam Mellor continued a recovery of sorts and became the only home batsmen to reach double figures but when Moorhouse was out for 24 the end was not long in coming with Mellor not out on 14. The home side had posted 56 in just 19 overs. Dixon (6-36) and Mellor (4-18) did all the damage. If the first half had been barely believable the second half did as much if not more to out-do the first. Needing a solid start, Bridge got the exact opposite with a bizarre run out in the first over which sent Paul Smith back to the pavilion. Visiting nerves were steadied as Tim Helliwell looked in little trouble, taking the score to 26-1. The introduction of Murfet brought a couple of wickets and even when Helliwell (18) hit a delivery from Moorhouse straight to Luke Brooksby, a bowling point looked like the only reward for the home team at 34-4. Jamie Moorhouse (5-15) had other ideas as his second hat-trick of the season threatened to turn the tables as Bridge slumped to 48-7. Hearts were really pumping as two more wickets fell before James Holdsworth steered his side home with an undefeated 19. Bridge picked up 12 points to Illingworth’s two, which barely reflected the closeness of the result, and they moved to within eight points of the leaders. Great Horton PC, the third promotion contenders with three games left, took maximum points at home to Queensbury, overhauling their visitors’ 204 all out with seven wickets in hand, Chris Brown hitting 76 not out. Queensbury look set to go down alongside already doomed Stones, who lost by six wickets at Clayton in spite of 89 not out from Ralph Bownas helping the Ripponden side to 195-9. Simon Collins (5-35 and 59) was the star performer as Bradshaw won by five wickets at Blackley, for whom opener Macauley Shiel made 65. Collins and Dean Cotton (63) added 119 as Blackley’s 217 all out was topped. Scores: *Blackley 217 (Shiel 65, Collins 5-35), Bradshaw 221-5 (Cotton 63, Collins 59): pts 4-12. Stones 195 (Bownas 89*, Roe 5-42), *Clayton 201-4 (Evans 52, Artist 48): pts 4-12. Queensbury 204 (Challis 64, Senior 47), *Great Horton PC 206-3 (Brown 76*, Beesley 44): pts 3-12. *Illingworth St Mary’s 56 (Dixon 6-36, Mellor 4-18), Sowerby Bridge 57-9 (Moorhouse 5-15): pts 2-12. Points (after 18): Illingworth SM 182, Sowerby Bridge 174, Great Horton PC 167, Clayton 145, Bradshaw 131, Blackley 101, Queensbury 73, Stones 44. Division Two games went very much according to the form book with 12 point wins for the higher-placed side in every fixture. Leaders Mount had a 49 run win at Leymoor. No 7 batsman Ismail Myatt (73 no) helped them to 250-7 and Mark Coulson (66) and Pierce Walker (44) lacked support in the reply as Mohammed Rafiq (5-40) made his presence felt. Cullingworth were skittled for 34 away to second-placed Luddenden Foot and 15 of those were extras as Hayden Bruce took 4-6 in 10 overs. Foot lost only one wicket to win a match lasting less than 25 overs. 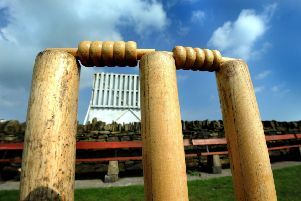 Old Town were 53-run home winners against Low Moor HT while Upper Hopton continue to enjoy life at temporary base Stainland, easily beating Bradley & Colnebridge. Hopton made 210-8 and Bradley mustered only 98 in reply with Edward Kay (5-51) getting the bit between his teeth. Chris Brook (67) and Jordan Croft (51) were among the runs for Outlane at home to Greetland. Chasing 245-9, openers Paul Quarmby (51) and Mushtaq Mohammed (50) put on 106 runs but Alex Dorotiak (5-67) undermined Greetland’s effort and they fell 25 runs short. Scores: Mount 250-7 (Mayat 73*, Abed 57), *Leymoor 201 (Coulson 66, Walker 44, Rafiq 5-40): pts 12-5. Cullingworth 34 (Bruce 4-6), *Luddenden Foot 37-1: pts 0-12. *Old Town 244, Low Moor HT 191: pts 12-6. *Outlane 245-9 (Brook 67, J Croft 51, Moody 5-74), Greetland 220 (Quarmby 51, Mohammed 50, Dorotiak 5-67): pts 12-5. *Upper Hopton 210-8 (France 54, Broadbent 51*, Wightman 43, Daniel 42), Bradley & Colnebridge 98 (Kay 5-51): pts 12-2. Points (after 18): Mount 173, Luddenden Foot 161, Upper Hopton 152, Old Town 141, Bradley & Colnebridge 134, Leymoor 131, Low Moor 122, Outlane 110, Greetland 80, Cullingworth 44.